Hi! Today I have the card I shared this week in my Facebook Live – a Pop-Up Wiper card! This is so much fun – I hope you’ll give it a try! 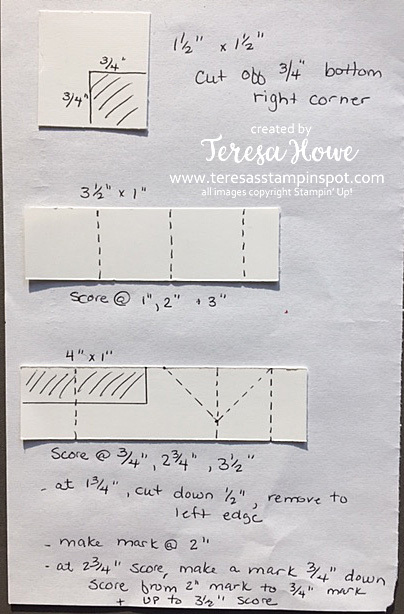 Please note the above measurements are the outside edges of the Stitched Rectangle Dies – the actual rectangles will be slightly smaller. If you have any questions, please ask! But hopefully between the pictures above and the video, you will see how it all comes together. I am still offering to send those who place an order through my on-line store using this Host Code: 9DY7KYRM by March 24th, a template showing how the mechanism sits inside the card. Sale-A-Bration ends on March 31st!! Don’t forget to get your FREE product with a minimum $50 purchase! Hi! Had a little fun yesterday playing with the Calligraphy Essentials stamp set and heat embossing! 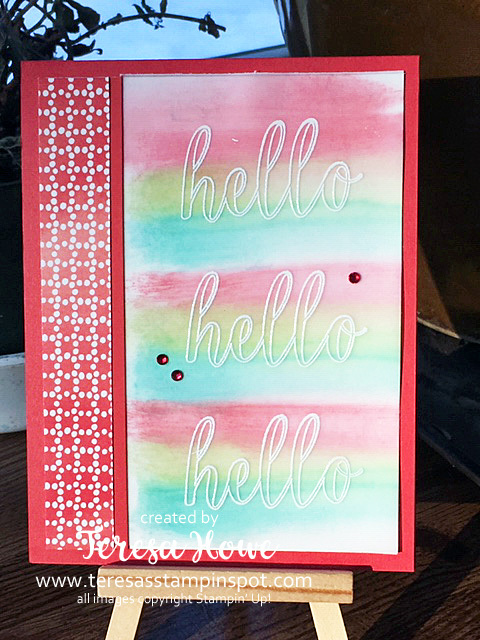 I stamped the Hello from in Versamark on a piece of Vellum Cardstock, sprinkled White Embossing Powder and heat set with the heat tool. I then flipped the vellum over, and sponged Poppy Parade, Granny Apple Green and Bermuda Bay ink on the back. A fun and quick technique. The vellum is mounted on a piece of Whisper White card stock. The base is Poppy Parade and I used a scrap of Designers Series Paper from the Painted Seasons Sale-A-Bration Designer Series Pack. The rhinestones are colored with Dark Real Red Stampin’ Blends. Did you know you can now choose the Painted Seasons Designer Series Paper with a $50 order as your Sale-A-Bration reward? Buy hurry! Sale-A-Bration ends on March 31st! I also wanted to let you know that the following Sale-A-Bration coordination products have sold out. If you have any of the others on your wish list, order soon! You’ll find all these great products in my on-line store. Use Host Code: 9DY7KYRM and you’ll receive a FREE gift from me as well! A $50 order not only qualifies you for a Sale-A-Bration, you’ll also get the FREE Gift and a FREE Tutorial! Hope you liked today’s card! Author TeresaPosted on March 13, 2019 March 13, 2019 Categories CardsTags 2018-19 Annual Catalog, 2019 Sale-A-Bration, Friendship2 Comments on Hello, Hello, Hello! to brighten your day! I know it isn’t spring yet, but thought maybe today, you could use a little spring. Not to mention, I LOVE how this turned out! So cute!!! 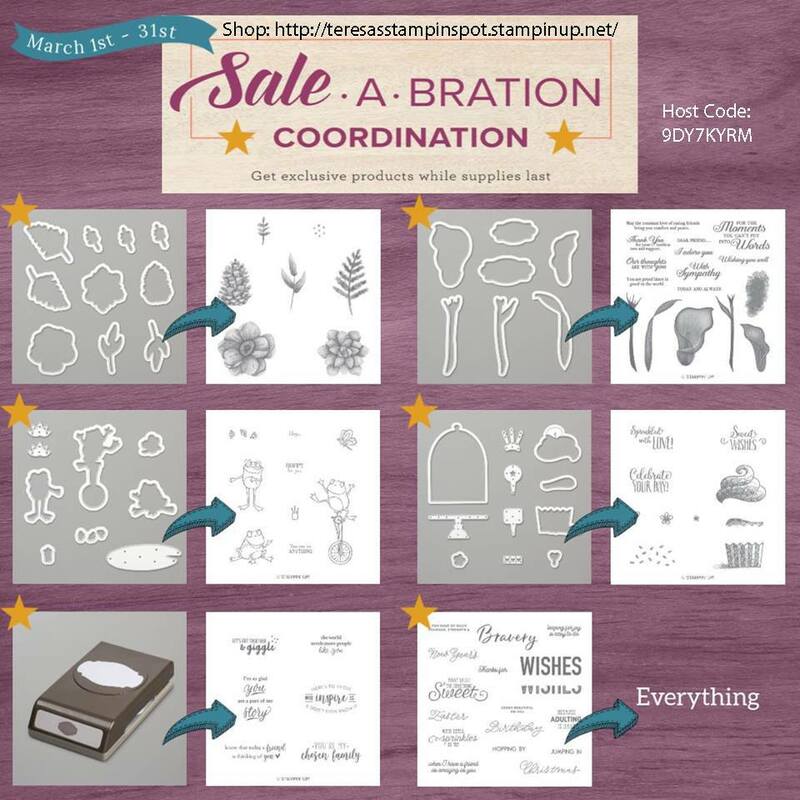 I love the Sale-A-Bration Painted Seasons Designer Series Paper – so pretty and can be used with so many stamp sets! 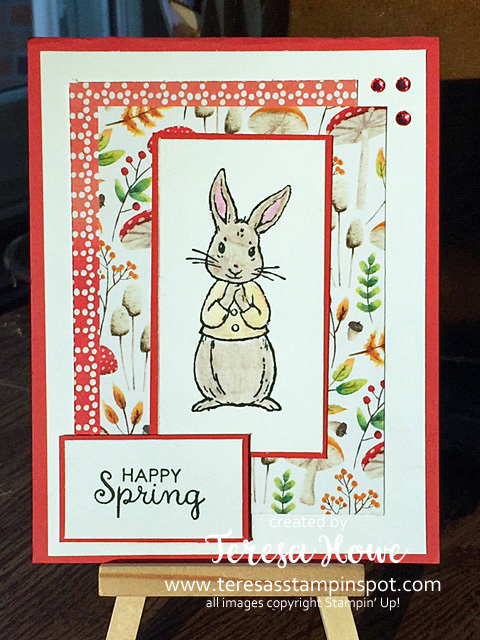 For this card, I paired the paper with the bunny from Fable Friends Stamp Set found in the Occasions Catalog. He is colored using our Watercolor Pencils and a Blender Pen. Just adorable! I also colored three Rhinestones using the Light Real Red Stampin’ Blends for just a touch of bling in the corner. The base of the card and layers are Poppy Parade. I have a few little great nieces and nephews and might make a few to send their way for Easter. Don’t forget, we are winding down to the end of Sale-A-Bration – there are only a few weeks left to get your FREE products with a $50 purchase. Just click on a product below to go to my online store and shop! I do! I do! 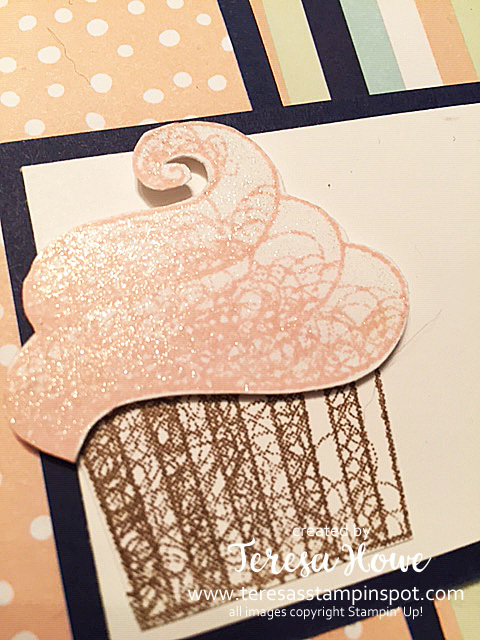 Have a quick and easy card for you today featuring the Hello Cupcake Sale-A-Bration stamp set! So cute! And so easy to create using the stamps in the set! For this card, the cupcake is stamped in Soft Suede ink, the frosting in Pineapple Punch and the sprinkles in Bermuda Bay. The sentiment is also stamped in Bermuda Bay ink. 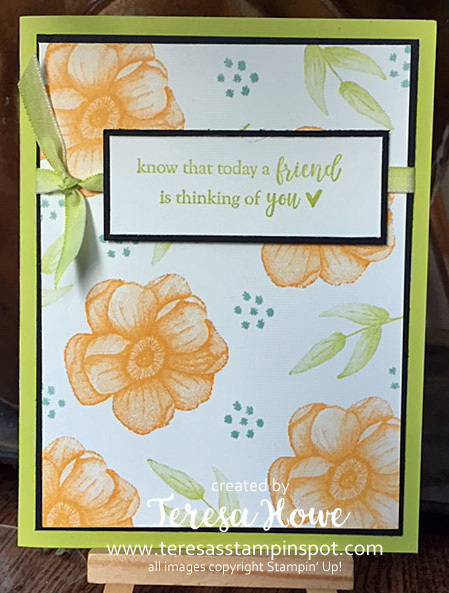 The Designer Series Paper strip is from the How Sweet It Is DSP pack found in the Occasions Catalog. Want to know something even sweeter? Check out these new products offered today that are available to purchase and coordinate with your FREE Sale-a-Bration items! Just click the link below to order your favorites! 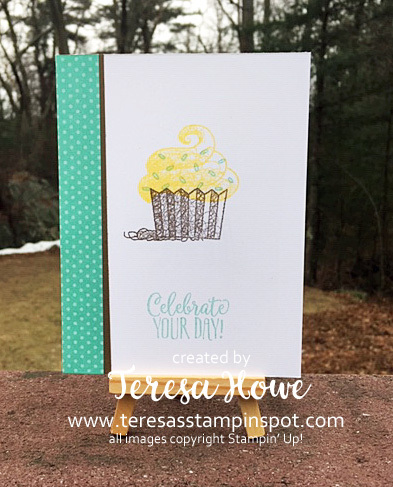 Author TeresaPosted on March 1, 2019 Categories CardsTags 2019 Sale-A-Bration, Birthday, CardsLeave a comment on Who Wants A Cupcake? Hi! Today I had a chance to play with the new Painted Seasons Sale-A-Bration offering which is now available for FREE with a $100 (US, prior to S/H and tax) purchase! The colors for both cards are Mango Melody, Pool Party and Lemon Lime Twist. For this one, I used Lemon Lime Twist Ombre Ribbon and base. For this one, I used Mango Melody for the base and Black Baker’s Twine. I like both – but think this one pops a bit more. Did you see the new Sale-A-Bration offerings? Check them out in the side bar if you haven’t! Shop my on-line store – click on any product below – for your favorite Stampin’ Up! products then add this bundle to your cart for FREE! when you hit the $100 purchase price! This is a set you will reach for ALL YEAR LONG! Don’t miss out! Hi! Today I have a card featuring the Beauty Abounds stamp set from the Occasions Catalog. This set is so pretty! I stamped the flourish in StaZOn Jet Black ink along the right hand side as well as along the bottom. The flowers were colored with Petal Pink and Flirty Flamingo while the leaves were colored with Soft Seafoam and Pear Pizzazz. The butterflies are colored in Flirty Flamingo. 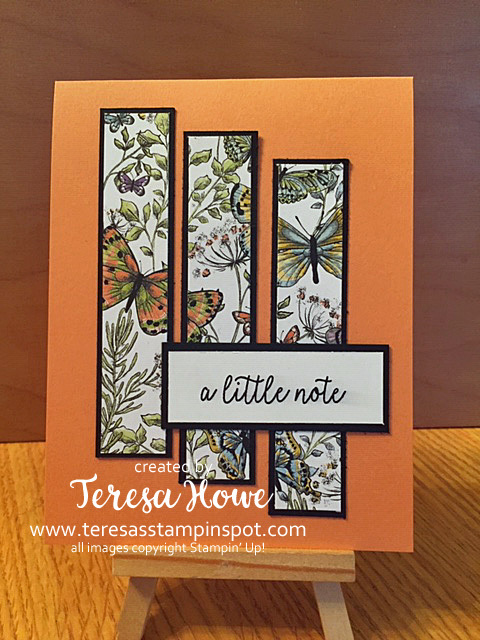 The sentiment is stamped in Flirty Flamingo and punched with the 1 3/4″ circle punch. This is layered on a 2″ Circle of Pear Pizzazz. A butterfly element from the Sale-A-Bration catalog is colored on the edges with a Crumb Cake marker and attached using a glue dot. These wooden elements are a FREE choice during Sale-A-Bration where a $50 (US, prior to S/H and tax) earns you a FREE product! The base for the card is Soft Sea Foam and measures 4 1/4″ x 11″ – scored at 5 1/2″. The mat is Pear Pizzazz and measures 4″ x 5 1/4″. The Whisper White panel measures 3 3/4″ x 5″. There are a set of coordinating dies that when purchased with the stamp set as a bundle, saves you 10%! A great bundle for any crafter! Hi! Back today with another birthday card using the fun flap fold showcased last week. 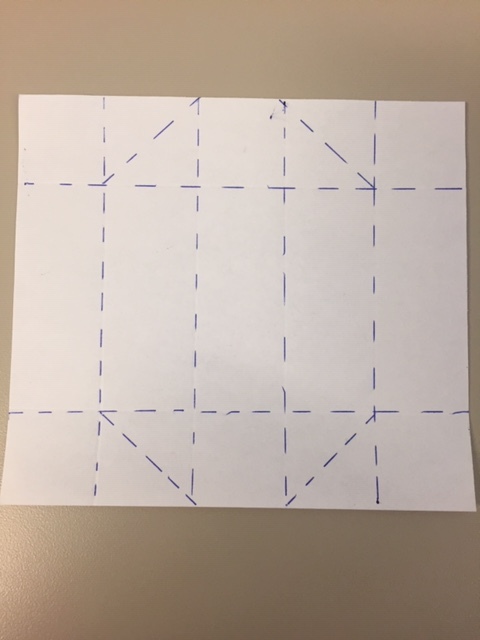 In case you missed it, here is a link to the post where I shared this fold and a PDF with the dimensions for the layers. I hope you enjoyed today’s card! Hi! 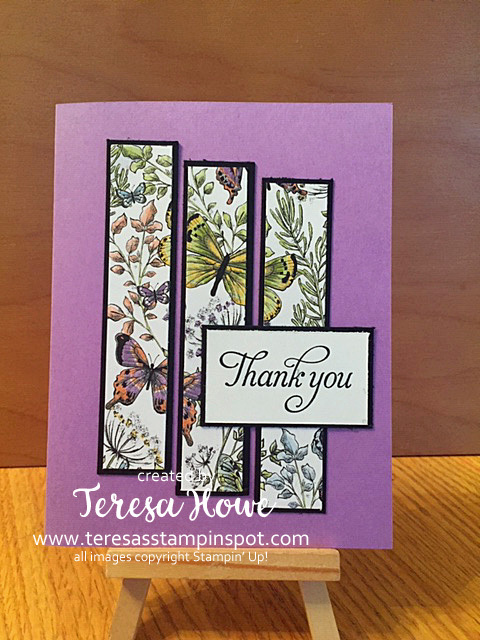 Welcome to today’s post – using some of those Designer Series Scraps! We all have them and this layout is perfect for using some of them up! I just love this layout and this Design Series Paper is just gorgeous! The staggered look of the panels truly appeals to me. I used a scrap that was 2 1/4″ x 4″. I cut this into 3 pieces measuring 3/4″ x 4″. These are then mounted on Basic Black mats that measure 7/8″ x 4 1/8″. The base color for this card is Highland Heather. 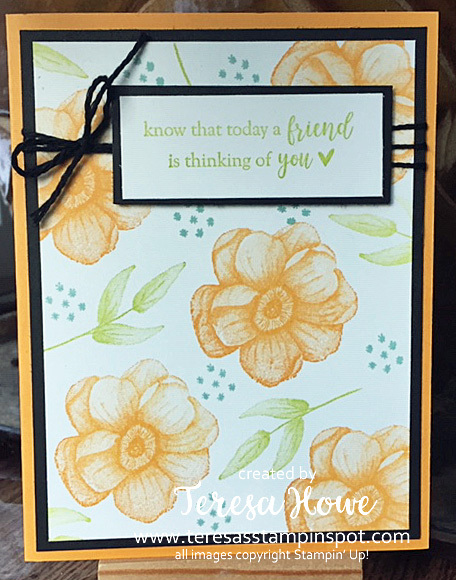 The sentiment is from the Humming Along stamp set in the Occasions Catalog. This Designer Series Paper is a FREE choice during Sale-A-Bration when you place a $50 (US, prior to S/H and tax) order. It is called Botanical Butterfly. It coordinates with the Butterfly Gala bundle in the Occasions Catalog – there are sheets in this Designer Series Paper Pack which can be used with the punch. Click on the product list below to be taken to my on-line store where you can purchase any of the products (and get your FREE Designer Series Paper) used in today’s card. Yes, I’ve made a few of these cards with this layout. I think they’ll make a great gift for someone special. 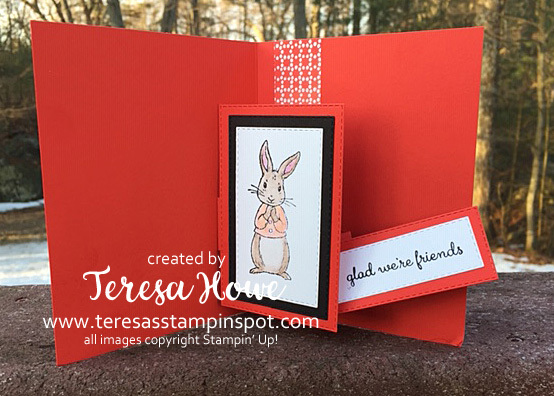 Author TeresaPosted on January 19, 2019 January 18, 2019 Categories CardsTags 2019 Occasions, 2019 Sale-A-Bration, Cards, CAS, DSPLeave a comment on Got Scraps? Hi! A little spring cheer for you today with this No Adhesive Needed treat holder! The size of the Designer Series Paper is 4 1/2″ x 5″. Score on the 4 1/2″ side at 1″ and 3 1/2″. Score on the 5″ side at 1″, 2″, 3″, and 4″. Then in the second and forth square on the top and bottom, score diagonally. It is pretty easy to make. The Butterfly is colored using sponge daubers and Highland Heather and Lemon Lime Twist ink. 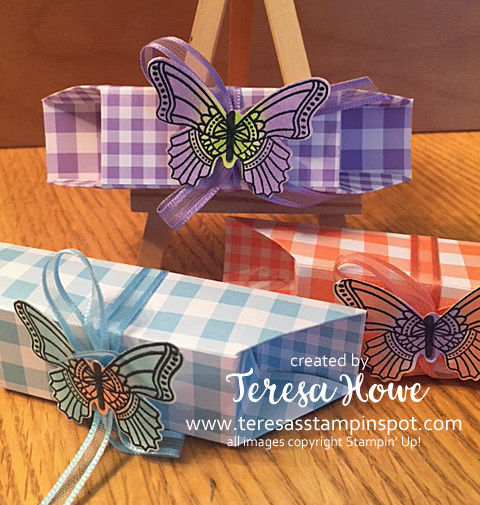 (Ok, so I did use Glue Dots to adhere the butterfly to the ribbon)… But no adhesive was used to make the box itself or to keep it closed! The ribbon is from the Sale-A-Bration catalog and is FREE when you place a $50 (US, prior to S/H and tax) order in my on-line store. I hope you enjoyed today’s project! 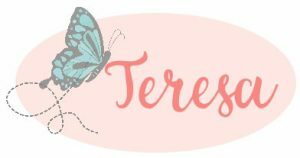 Author TeresaPosted on January 17, 2019 Categories Treat HolderTags 2019 Occasions, 2019 Sale-A-Bration, Chocolate, Facebook LiveLeave a comment on No Adhesive Needed!